The Body Shop Shea Shower Cream: They really mean it when they call it shower cream. The lotion-like texture is moisturizing. It also foams wells and cleans properly. The shower cream does leave behind some nutty aroma. But, not as strong as Moringa one. 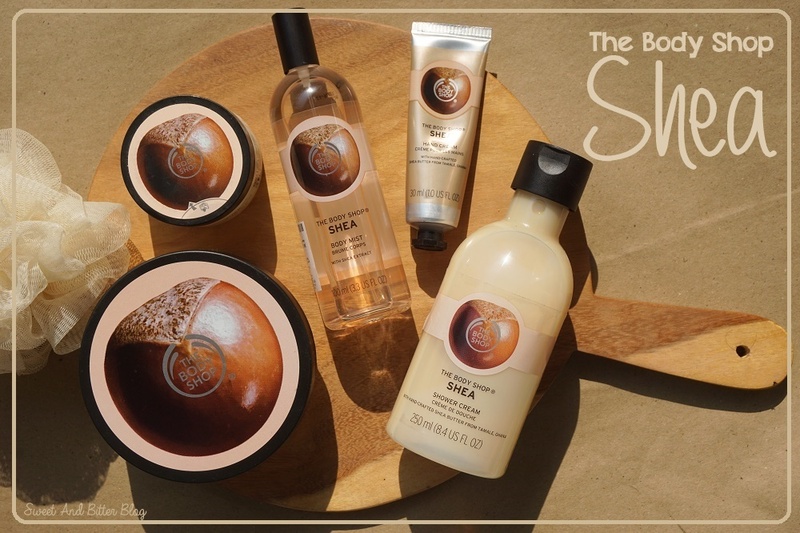 The Body Shop Shea Body Scrub: It is a sugar scrub so, not very abrasive but yet effective. The scrub has a decent amount of oil/butter which leaves behind a well moisturized exfoliated skin. I used it mainly on my arms and underarms as well. The quantity is less so, I have to ration this. 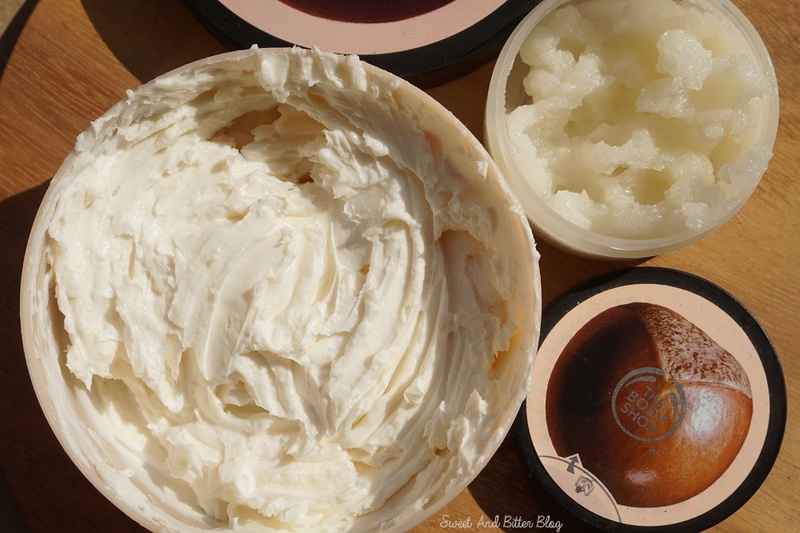 The Body Shop Shea Body Butter: As I mentioned, this was the first body butter I tried. This has a special place in my heart. This is so far the most moisturizing body butter I have tried. It is heavy but easy to apply. It sort of melt when it comes in contact with fingers and glides smoothly on the skin. It does not feel heavy or sticky. I highly recommend this body butter. 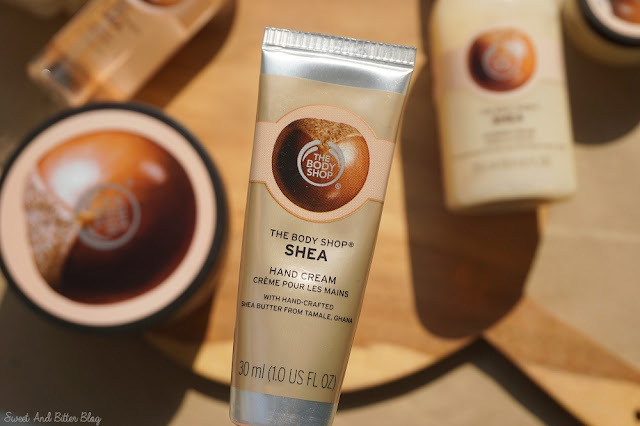 The Body Shop Shea Hand Cream: This is the product that I connect the least with. I always like to use a hand cream with a floral or fruity fragrance. The nutty aroma is different from what my senses are used to. So, I use it the least. I think of it as it less-moisturizing-shea-body-butter for travel purpose. The tube is sturdy and is not like the tin ones that TBS used to make long back. 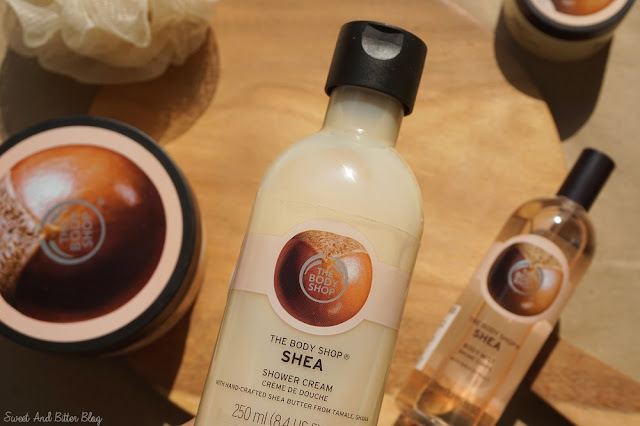 The Body Shop Shea Body Mist: What is better than smelling like shea Godness after bathing with the shea shower cream and 'marinating' in shea body butter? Layering it up and sealing it with the Shea body mist to make the fragrance last longer. Unfortunately, the body mist alone is not long lasting. But, it works well for layering. 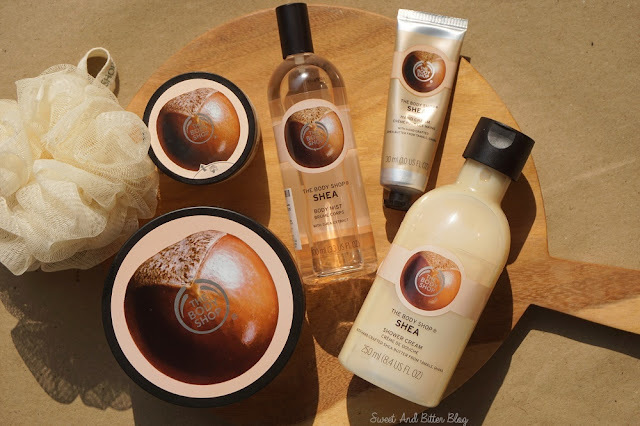 Overall: I love all The Body Shop Shea products. If I have to choose, then I would go with the Shea Body Butter. If you find it too thick then go with the whipped body lotion. Additionally, get the shower gel. If you wish to splurge then go ahead with the body scrub. I won't recommend the body mist much.